Cisa NW Lock Fitting Service telephone 0208 800 6041 for NW London. Do you need an electric Cisa NW Lock Fitting Service from a Number "ONE" North West London Lock Fitting Company? Fitted to your front door or commercial premises, for high security upgrading of your entryphone system. An ideal Communal Door Lock, replacing a standard rim latch to an entry phone system. Then!! Telephone 0208 800 6041 to speak to one of our friendly Locksmith Team of North London Locksmiths Ltd.
A Company which can be trusted to deliver what it promises. The Number "ONE" Cisa NW Lock North West London Fitting Service. Communal door and only have a basic night latch fitted? Do you know how ansecure this is? Time to fit an electric lock to your door, which can be undertaken by our Cisa NW London fitting team. This will stop the latch being slipped and if fitted with a London Bar will give you so much more security. This strong electric lock is an extremely secure lock when fitted to an entryphone system; there are a number of different models in the Cisa electric lock range, which can be used for various applications. Ideal as a Communal Door Lock. There are Electric locks for wooden doors and metal gates and can be used with key, swipe card, digital codes or even opened with a remote control unit. The units are very strong fitments and can be fitted to both inward and outward doors, left and right handed doors. Pull resistent up to 2000kg, tested for one million cycles. Suited for inward and outward opening and for left and right handed doors. With or without mechical button. 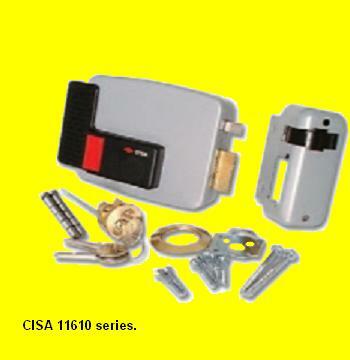 Features the Cisa patented dead locking latch. Zinc-plated steel case and striker. 12 V ac CE. Suitable for heavy as well as light weight doors. Supplied with three keys. Can be fitted with key hold back or without. The 11610 Series of Electric Locks forTimber Doors. this is an ideal lock for a COMMUNAL DOOR LOCK and doors where security is needed in an electric release situation. This lock is key operated from the outside and has an Inside manual exit button, which when pressed, will open the door. It has a deadlatching action, which means it cannot be slipped and cannot be deadlocked, from the inside or outside, there fore ideal for fire regulations. Will still open by pressing exit button, without power. Comes with 3 keys and all fittings. INWARD AND OUTWARD VERSIONS OF THESE MODEL ARE AVAILABLE. WILL WORK WITHOUT A POWER SOURCE, AS A STAND ALONE LOCK. Our Lock Fitting Cisa NW London Lock engineers can fit this lock for you, all that is required is a supply of power to the lock area, it will replace a normal night latch which is on an electric release. Apart from our Cisa NW Lock London Fitting Service, we offer these locks at good discounted prices through our WEB SHOP. 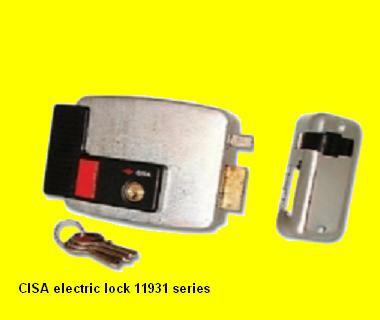 The 11630 series of the Electric Lock has the same functions as the lock above, except it can be locked from the inside with a key, preventing the lock being opened from the inside. This lock is ideal for shops and offices where glass is fitted into the door, as when locked from the inside, if the glass is broken the lock cannot be opened. The latch can also be held back, by operation of the key. If you need the Services of a reliable London Company then call the number above. Our qualified Carpenters and Locksmiths are at your beck and call to undertake any Lock Change or Cisa NW Lock Fitting you may require, whether it is an emergency, where keys have been lost or stolen, or a lock fitting, we will be there to help you. You will be charged a fair price, without any hidden costs on top of what you were quoted when booking your work with our office. 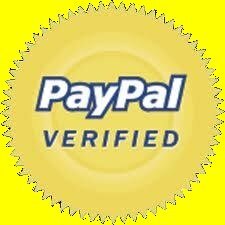 No need to pay silly call out charges, whatever you are quoted, you will be charged, no hidden charges on top. IF YOU LIVE IN OR NEAR THE NORTH LONDON OR SURROUNDING AREAS AND WOULD LIKE TO KNOW ABOUT OUR CISA NW LONDON LOCK FITTING SERVICE, PLEASE TELEPHONE 0208 800 6041.....YOU ARE NOT FAR FROM ONE OF OUR EMERGENCY LOCKSMITHS OR CARPENTERS.